Ultrafiltration machine cleaning program, you know which kind? 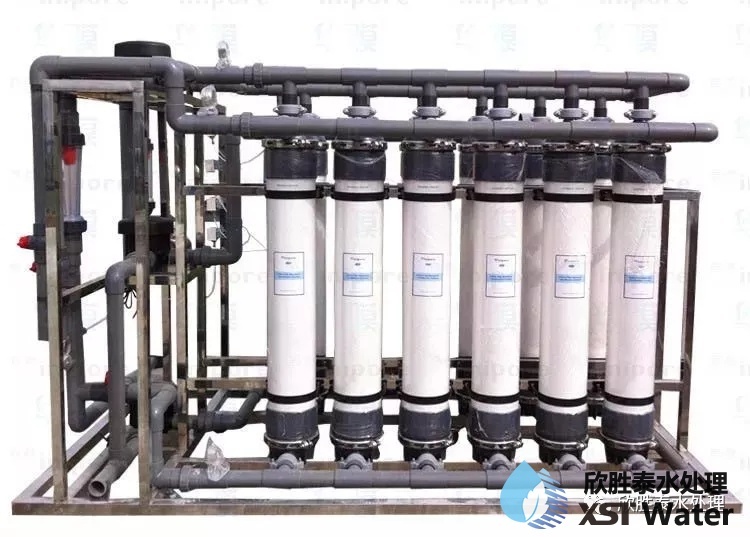 - Xi'an Xinshengtai Water Treatment Technology Co., Ltd.
Home Products Ultra Filtration System Ultrafiltration machine cleaning program, you know which kind? The normal maintenance cleaning of ultrafiltration machines mainly includes physical cleaning and chemical cleaning. Among them, physical cleaning includes positive washing, back washing, and air washing (mainly including gas scrubbing, gas water washing). Periodic physical cleaning mainly refers to setting the system to run for a period of time, performing short-term positive wash, backwash, and air wash, or a cleaning method that combines these three methods. 1. Washing: Washing is accomplished by opening the inlet valve and closing the water valve, so that the high flow rate of the rinsing liquid flows out of the concentrated water discharge valve, thereby performing high-speed flushing on the membrane surface and reducing the contaminant accumulation on the membrane surface. 2. Backwashing: This operation is opposite to filtration, that is, the backwash water enters the ultrafiltration fiber through the membrane to the concentrated water side from the clear liquid side, and passes through a large flow of backwash water to contaminate the membrane pores and the hollow fiber membrane surface. The material is rinsed off and the contaminants that have been rinsed out are discharged through the lower valve. 3. Gas Scrubbing: Remove contaminants from the membrane surface by gas wiping the membrane wire. Air washing: backwashing water is pumped from the supernatant side of the ultrafiltration membrane tube through the ultrafiltration backwashing pump and discharged into the concentrating side. At the same time, the compressed air is intermittently fed through the inlet of the ultrafiltration membrane tube, and the gas-water combination is effective for backwashing. The resulting shear forces are more effective in stripping the particles that contaminate the surface of the membrane and pulling some of the particles out of the ultrafiltration membrane tube. Each process is controlled by PLC. After running for a period of time, it can be cleaned, backwashed, and purged with air. It can remove pollutants on the membrane surface in a timely manner. This not only ensures the stable operation of the system, but also prolongs the chemical cleaning cycle. 4. Dispersive chemical cleaning: Chemicals are added to the backwash (also referred to as “dispersed drug wash” or “chemically enhanced backwash” in this system). The system is set to perform dosing backwash after cumulatively running for a certain period of time for each system, that is, a certain proportion of backwashing agent is added to the backwashing solution through a dosing pump, and the membrane is subjected to a short-term soaking cleaning method. It is automatic, but it is necessary to confirm that the medicine in the medicine box is sufficient. The added anti-rinsing agent depends on the quality of the treated water. Details can be consulted with the company. 5. Chemical cleaning: After a period of normal operation, the ultrafiltration membrane module is contaminated by suspended particles, organic substances and other substances in the wastewater. As a result, the flow rate of the produced water decreases, and the membrane pressure difference increases (ie, the “pressure coefficient of water production” decreases). ). And this phenomenon cannot be recovered by physical methods and disperse chemical cleaning. In order to restore the membrane module to its original performance, chemical cleaning must be performed regularly. The specific cleaning program should be determined by the nature of the pollutants and the degree of contamination. Pickling solution: The ultrafiltration device is cleaned with an acidic solution. The cleaning solution is suitable for non-organic pollution of the water inlet side of the membrane when the inorganic salt content in the inlet water exceeds the design standard or the suspended water of the ultrafiltration membrane module is particularly high. Alkaline wash solution: Use an alkaline oxidizer solution to clean the ultrafiltration unit. When the organic content in the influent water is high, it may cause the filter membrane to be contaminated by organic substances. And when the conditions are conducive to biological survival, some bacteria and algae will also be produced in the ultrafiltration membrane assembly, thereby causing biological contamination. Citric acid, sodium hypochlorite and sodium hydroxide are all industrial grades. 1) Avoid direct contact with such agents as NaOH and NaClO. These agents have different degrees of corrosiveness, and NaClO is also a strong oxidant. 2) The pressure of the pipeline should be controlled during cleaning to avoid chemical splashing caused by excessive pressure. 1) Gas-water backwashing must be performed before the ultrafiltration unit performs chemical cleaning. 2) The entire cleaning process of the ultrafiltration device takes at least 2 to 4 hours. 3) If the ultrafiltration unit is down for more than three days after cleaning, it must be maintained in accordance with the long-term shutdown requirement. 4) The cleaning solution must be formulated with ultrafiltration or higher quality water. 5) The cleaning agent must be filtered through a 50 μm filter before it is recycled to the membrane module to remove any contaminants that may be present in the cleaning solution. 6) The temperature of the cleaning solution is controlled between 25°C and 40°C. Increasing the temperature of the cleaning solution can increase the cleaning efficiency, but it is strictly prohibited that the pH exceeds 12. 7) If necessary, a variety of cleaning agents can be used for cleaning, but cleaning agents and bactericides cannot cause damage to the membrane and the component materials. And after each cleaning, the cleaning agent should be drained and the system rinsed with ultra-filtered water before cleaning with another cleaning agent. 8) The first 10-15% of the first dirty cleaning solution is not circulated with the chemical cleaning solution and is discharged through the exhaust valve on the membrane frame. Use 1-2% citric acid solution and adjust the pH to 2~4 or 0.3% HCl solution with ammonia, suitable for iron pollution and carbonate crystallization fouling. a) Press Close to close the UF system. b) Close all valves of the UF system. c) Prepare 1-2% citric acid in the cleaning solution tank and add ammonia to adjust the pH value of 2~4 or 0.3% HCl solution, and stir it to make it evenly mixed. a) Start the cleaning pump, slowly open the outlet valve of the cleaning water pump, the inlet and outlet valves of the ultrafiltration device cleaning fluid, and control the flow rate of 4~6m3/h of each membrane module so that the cleaning solution enters the membrane module and returns to the cleaning solution tank. Cycle cleaning time is 30min. b) Close the cleaning pump and allow it to soak for 60 minutes. c) Empty the cleaning solution tank and cleaning filter and rinse it with ultrafiltration water. After the cleaning is completed, the UF membrane module needs to be washed with ultrafiltration water. The purpose of the flushing is to remove the residual chemical solution from the ultrafiltration device. 0.1% NaClO + 0.05% NaOH solution for cleaning of ultrafiltration membrane modules caused by organic matter and active organisms. Evaluate the effects of chemical cleaning. Observe the pressure coefficient of the produced water. If the pressure coefficient of the produced water can be restored to more than 95% after the last chemical cleaning, the chemical cleaning will achieve the desired effect. Otherwise, the chemical cleaning agent soaking time or chemical cleaning should be extended. The effective concentration of the agent. In order to prevent microbial contamination on the ultrafiltration membrane, it is necessary to periodically add a bactericide to the ultrafiltration system. The type of the sterilant to be added must be determined according to the process conditions. More commonly used sodium hypochlorite. It is generally set up once every two weeks. The dosage method can be used for impact dosing before pretreatment. The dosing concentration is about 50 ppm, and the dosing time is 2.0 hours. It can also be carried out by continuous and short-term dosing.